This is a photo taken by Bob Johnson during the Winter of 1940. Jim Bailey and his tandem partner are on the left and on the right side is a surfer commonly known as "Doaks". His real name was Charles Butler. Doaks became famous for surfing at the Long Beach Flood Control a few years later. His photo appeared in Doc Ball's California Surfriders in 1946. Doakes enlisted in the Navy during World War II but went down with his ship in the early stages of the war with Japan. Jim Bailey was well known for surfing waves with his dog Rusty on the front of his surfboard. Jim Bailey lived in Hermosa Beach and was an outstanding lifeguard in the South Bay for many years. 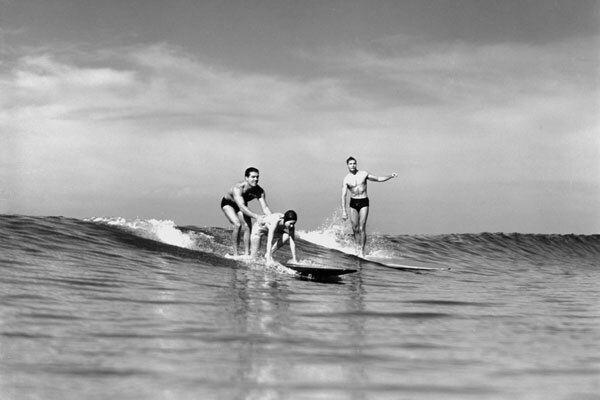 More of Bob Johnson's early surfing photos can soon be seen as part of the Surfing Heritage Foundation. I believe that Jim Bailey's tandem partner was his wife ( and my great Aunt, Mary "Sis" Bailey née Martinet. She passed away about a year ago. From what I was told, Jim was an Hermosa beach Barber and when the surf was up, he would leave in the middle of giving a haircut. Now that's dedication! Jim Bailey lived up the street from my mom on 5th Street in Hermosa. He taught my mom, uncle and aunt how to swim and surf. She has fond memories of both him and his wife. Jim was widely known as "Mother Bailey" because he trained most of the lifeguards after the War and into the 1960's. He lived on 5th Street in Hermosa Beach, just three houses off the strand. Except for spending the War on a ship patrolling the Aleutian Islands, he was a lifeguard until he retired. Before becoming a life guard, he work in a beauty shop owned his dad, Al Bailey. Also, he cut the hair of most lifeguards for many years. He was a very special fellow.